In the wake of last week’s announcement that Gearbox would be taking control of the venerable Homeworld franchise, the prevailing attitude I’ve encountered has been confusion. And now that the smoke has cleared and the dust settled, we learn that not only did the Texas-based developer win the rights to one of the most venerable franchises in RTS history, but they won it over the likes of Stardock and Paradox—companies with histories and portfolios stuffed full of strategy games. Which leaves us all with one burning question: Why? [singlepic id=11866 w=320 h=240 float=left]At a glance, one would be hard pressed to come up with a developer and franchise less suited to one another. Homeworld is a masterpiece of slow and methodical gameplay– a serious space opera mixing equal parts Battlestar Galactica, Journey to the West, and Middle Eastern mythology. Gearbox, on the other hand, is recently known for making campy, sardonic first person shooters like Borderlands, Duke Nukem Forever, and the abysmal Aliens: Colonial Marines. 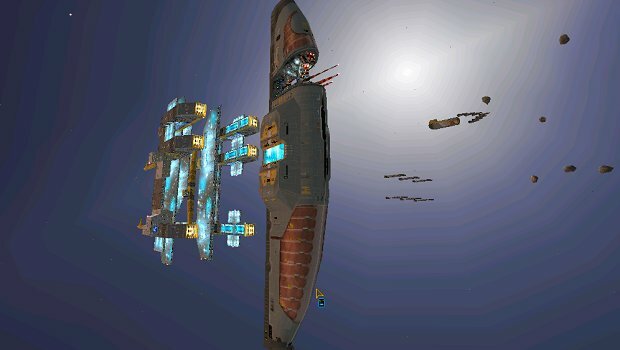 What possible interest could Gearbox have with Homeworld? Perhaps the answer is as simple as: they really like it, they think there’s money in it, and they think they can do it justice? The press release that Gearbox sent out to announce their acquisition leaves a lot of room for interpretation, but there were a few things that stuck out to me. First, Gearbox’s Chief Creative officer was specifically named as “spearheading the acquisition.” Most press releases I’ve read don’t drop names like that — you’ll see a brief comment from a company executive about how the developer is “very excited to have blah blah blah.” This one is different—this press release portrays a lone man fighting to acquire the series. Why would he do that, you ask? Simple: he wants to make the game available. And why wouldn’t Gearbox be eager to re-release their latest acquisition? The Homeworld franchise is legendary—and legendarily hard to find. Each disc will cost upwards of $10 bucks on Amazon; for the spectacular Game of the Year Edition, which includes the famous soundtrack, you can expect to pay more than $40. Homeworld Cataclysm, the stand-alone expansion, will cost more than $20. These games are nearly 15 years old! Homeworld 2 isn’t any easier to find, and getting it to run on modern PCs is tricky. Because of these issues there’s been a constant clamoring for the games to appear on modern digital download services. But THQ, who owned both the Homeworld franchise and Relic Entertainment since 2007, never seemed interested in making the games available. Couple that with Relic’s refusal to make another entry, and you’ve got a recipe for fan frustration. TeamPixel’s “Save Homeworld” raised more than $70,000. Over 11,000 gamers have requested GoG attempt to license the rights to sell the game. Over 9,000 requested the same for Homeworld 2. Even Homeworld Cataclysm, a game that nobody played, has over 4,000 votes. All of this must have been enough to convince Gearbox that Homeworld is a viable franchise—else why would they buy it? A lot of the chatter around the Internet has been fears that Gearbox is going to rip the methodical strategy out of the franchise, mutating it into another twitchy shooter. Personally I think that’s unlikely. Licensed games trade in on the fame of the product they’re licensing. A company pays for the Aliens license because they expect the name to drive sales. The thing is…Homeworld doesn’t have that kind of recognition, despite the adoration of of its fans. First of all, Homeworld is a ancient PC title, and most modern console gamers I’ve talked to have never even heard of the series. Since most gamers nowadays don’t know anything about the Higaarans or the Taiidani, how can Gearbox hope the public will put any stock in the name? [singlepic id=11868 w=320 h=240 float=left]A fear of my own is that Gearbox’s writers aren’t up to writing a Homeworld game. The original and it’s expansion pack Cataclysm remain some of the best written games I’ve ever played. Homeworld 2 didn’t reach the heights of dramatic tension as its predecessors, but was still quality work. The thing about Homeworld is that it’s morbidly serious—there is essentially zero humor or levity in the series. Contrast this with Gearbox’s most famous game and you’ll see why I’m worried: Borderlands is a great game, but the writing is lighthearted and campy. Even the Brothers in Arms franchise had levity in the characters of Allen and Garnett. That said, the Brothers in Arms franchise does make serious attempts to depict the burden of war on the men who have to wage it, and not even the comic relief characters are safe. The Brothers in Arms series goes a long way to assuaging some of my angst concerning Gearbox’s franchise…but it’s been a while since we’ve seen hide or hair of that. Will Homeworld 3 be any good? Only time will tell. But whether Gearbox flubs it or not—indeed, whether they even make it or not—we can at least rest assured that Homeworld won’t be lost. THQ sat on the franchise for years while gamers clamored for it to be made available. Every indication indicates that Gearbox bought Homeworld with good intentions: making the franchise available to a new generation of PC gamers. Whether those intentions pave the road to heaven or hell remains to be seen. If Gearbox does nothing but release the franchise to GoG or Steam, they’ll have done more with it than THQ ever did.